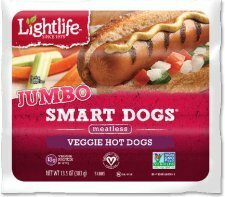 A 4 pack of these delicious Jumbo Smart Dogs....veggie hot dogs from Lightlife......a leader in the vegan/vegetarian industry! For more than 30 years, Lightlife has provided quality vegetarian and vegan foods prepared in the most healthy and sustainable manner. We strive to make it deliciously easy for people to eat veggie! If you have any questions about this product by Lightlife, contact us by completing and submitting the form below. If you are looking for a specif part number, please include it with your message.